Frustrated by the lack of ways to enjoy whiskey as a long drink, husband and wife team Tom and Talula created Sekforde - a botanical mixer designed to complement the flavours in whiskies. 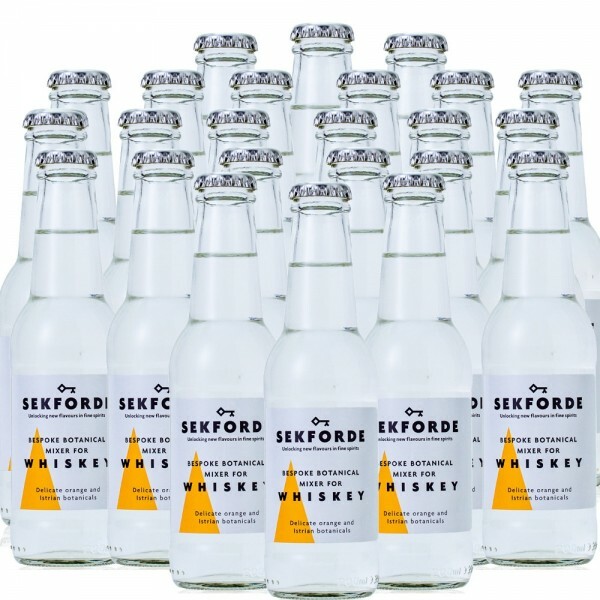 Unlike the sugary or artificially flavoured ginger beer and cola mixers that mask the flavours of whiskey, Sekforde is created to specifically enhance whiskey flavour profiles. Using the key Istrian botanicals of rosemary, gentian and orange, this combination lends a sophisticated depth and length when mixed with whiskey. Low in sugar, each 200ml serve is under 40 calories, and contains no artificial flavours, preservatives or sweeteners. Sekforde is very versatile and makes a beautiful drink with all bourbons, Irish whiskies and blended Scotches, especially with a sherry cask influence. However, do avoid mixing with Islay single malts because the stronger peaty or phenol flavours can be a mismatch. Serve over ice, with a twist of orange and a sprig of rosemary. Get stocked up for your Christmas shindig with this super-handy 24-pack.